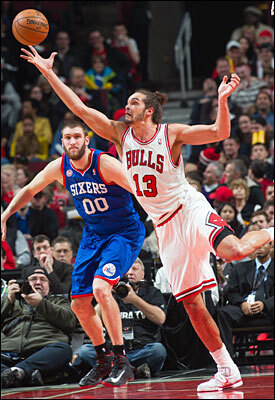 First you see Joakim Noah leaping and pivoting and retreating in rhythm, light on his feet and long on his extension. And then you see others in costume ducking and wincing and running. No, it’s not another of those shuffle dances that have become so popular around the NBA and with people without purpose. It’s really Jo’s Block Party, one of the most extraordinary individual statistical efforts not only in Bulls franchise history but in the annals of the modern NBA, which generally is considered the shot clock era starting in 1954-55. 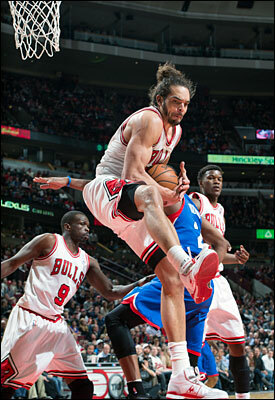 It was Noah’s astonishing 23 points, 21 rebounds and 11 blocks in the Thursday victory over the Philadelphia 76ers. The Bulls got a day off Friday to recover before Saturday’s home game against the Brooklyn Nets, who lost at home to Dallas Friday and now are a half game ahead of the 33-25 Bulls. But everyone is still trying to digest and savor Noah’s remarkable all around effort, which is elite in the modern era of big men. That would be the blocked shot era, which only began 1973-74. Blocks and steals weren’t NBA statistics before 1973-74 when Wilt Chamberlain, Bill Russell and Nate Thurmond, three of the most dominant and versatile big men ever, were long past their primes or out of the game. It doesn’t diminish Noah since Shaquille O’Neal only got a 20/20/10 triple-double once and Hakeem Olajuwon and Kareem Abdul-Jabbar twice. But Chamberlain had 78 triple-doubles and at different times in his career led the NBA in scoring, rebounding and assists. It’s likely he had his share of quadruple doubles, which have been achieved just four times. The last was by David Robinson and before that Olajuwon, Alvin Robertson and by Thurmond in his first game as a Bull Oct. 18, 1974 with 22 points, 14 rebounds, 13 assists and 12 blocks. After being thwarted in the playoffs ever year in the early 1970s by either Abdul-Jabbar or Chamberlain, the Bulls finally believed they had their answer and their first title with the acquisition of Thurmond, especially with Kareem hurt that season after punching a basket support in preseason and breaking his hand. But that turned out to be his principal highlight as Thurmond was benched before the end of the season for Tom Boerwinkle. The Bulls had traded Clifford Ray for Thurmond, and Ray would be a pivotal player for the Warriors in their conference finals win over the Bulls on the way to the 1975 title. In irony No. 2, the Bulls had a deal the previous season to trade Ray for Doug Collins, but it was nixed when Ray needed surgery. Nevertheless, Thurmond’s quadruple-double has generally been regarded as the gold standard of games by big men in team history along with Artis Gilmore’s 35 points, 15 rebounds and 11 blocks triple-double against Atlanta in 1977. Though with more than 20 in two categories, it’s reasonable to make the case a big man has never played a better game for the Bulls than Noah. Noah, by the way, was already threatening that earlier this season with 30 points, 23 rebounds and six assists in a win over Detroit. And in Noah’s two other triple-doubles in his career, the third category was assists, making him arguably the most versatile big man in team history. Block 1: Score tied 4-4 with 9:37 left in first quarter. Noah is defending Thaddeus Young, a quick 6-8 forward. Shooting guard Nick Young beats Marco Belinelli. Noah slides over for the block. The ball goes out of bounds to the Bulls as Nick Young hits it and Luol Deng makes a 14 footer in the Bulls’ possession. Block 2: Bulls leading 12-10 with 7:25 left in the first. Noah comes across again to block Nick Young, this time off a screen with the ball again going out of bounds off Young. Deng makes a 21 footer on the Bulls possession. Block 3: Bulls leading 15-12 with 5:04 left in the first. Evan Turner steals a Noah outlet pass and goes down the middle into the paint. Noah steps up and Turner passes to Spencer Hawes on his right. Noah turns back to block Hawes shot. Carlos Boozer rebounds. The Bulls call timeout and Boozer is fouled on a shot out of the timeout. Block 4: Bulls leading 23-22 to start the second quarter and with 11:41 left in the first half. Thaddeus Young drives and Noah blocks the ball out of bounds. The 76ers retain possession and Jrue Holiday scores. Block 5: Bulls leading 38-36 with 3:21 left in the second quarter. The Bulls get caught in switches with Boozer now on the perimeter against Thaddeus Young and Noah inside on Arnett Moultrie. Young beats Boozer. Noah steps across to the block the shot as the left handed Young comes down the left side of the lane. Boozer rebounds and Marco Belinelli misses a three. Block 6: Bulls leading 46-39 with 10:46 left in the third quarter. Hawes sets a screen on Belinelli, who gets over it. Hawes turns from the top of the key for a 20 footer that Noah blocks. Boozer grabs the rebound and Hinrich hits a 20-footer for the Bulls. Block 7: Bulls leading 50-42 with 8:41 left in the third quarter. Noah has Thaddeus Young on the right side. Nick Young beats Belinelli and then Boozer curling left down the lane. Noah comes across the blocks the shot. Nick Young rebounds and throws to Turner, who misses. Hawes misses a follow and Noah rebounds. Block 8: Bulls leading 68-62 with 11:34 left in the fourth quarter. Nate Robinson is stripped on a drive by Holiday. Noah is at the top of the key. He races back with Thaddeus Young coming down the right side on the fast break. Noah squares up and blocks Thaddeus Young’s shot. Noah rebounds the block and outlets to Hinrich who goes to Boozer for an 18 footer. Block 9: Bulls leading 77-71 with 6:25 left in the fourth quarter. The 76ers run a weak side pick on the right side to distract Noah, who is on Hawes. Jeremy Pargo then drives in on the left beating Nate Robinson. Noah blocks the shot. He then saves it to Robinson as it is going out of bounds. Robinson then hits a three from on top after throwing it inside to Hinrich first. Block 11: Bulls still leading 80-71 on the next 76ers possession with 5:35 left after Deng misses a three. Turner beats Jimmy Butler in transition as Noah steps up to block the shot as it deflects to Robinson, who misses a jumper in transition. 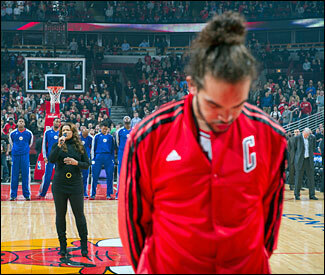 So where did Noah’s game rank in Bulls history, at least statistically? at least 20 points, 20 rebounds, 10 blocks and shooting at least 65 percent from the field. Michael Jordan’s 63 points in the playoffs against Boston may be the most impressive given the competition being one of the greatest teams in NBA history even though it was in a loss and double overtime. You’d also have to look at Jordan’s 69 points against the Cavaliers in March 1990 that included 18 rebounds and six assists. Though I might have preferred Jordan’s triple-double in 1989 with 47 points, 11 rebounds and 13 assists, meaning Jordan had a hand in 73 of the 105 points as the Bulls did lose. In a remarkable big man game, Charles Oakley had 35 points and 26 rebounds in an overtime loss to Milwaukee in 1986 and Tom Boerwinkle’s had a franchise-high 37 rebounds along with 22 points in a 1970 win over Phoenix. And in perhaps the best ever point guard game Guy Rodgers in the second game in franchise history in 1966 had 22 points, 21 assists and 10 rebounds against Thurmond and Rick Barry’s Warriors. Noah’s certainly in a very lively conversation.